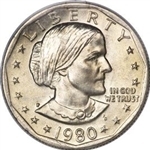 The Susan B. Anthony Dollar was minted from 1979 to 1981, and again in 1999. It depicts women's suffrage campaigner Susan B. Anthony on a dollar coin. It was the first circulating U.S. coin with the portrait of an actual woman rather than an allegorical female figure such as 'Liberty'. The reverse depicts an eagle flying above the moon (with the Earth in the background), a design adapted from the Apollo 11 mission insignia that was also present on the previously issued Eisenhower Dollar.